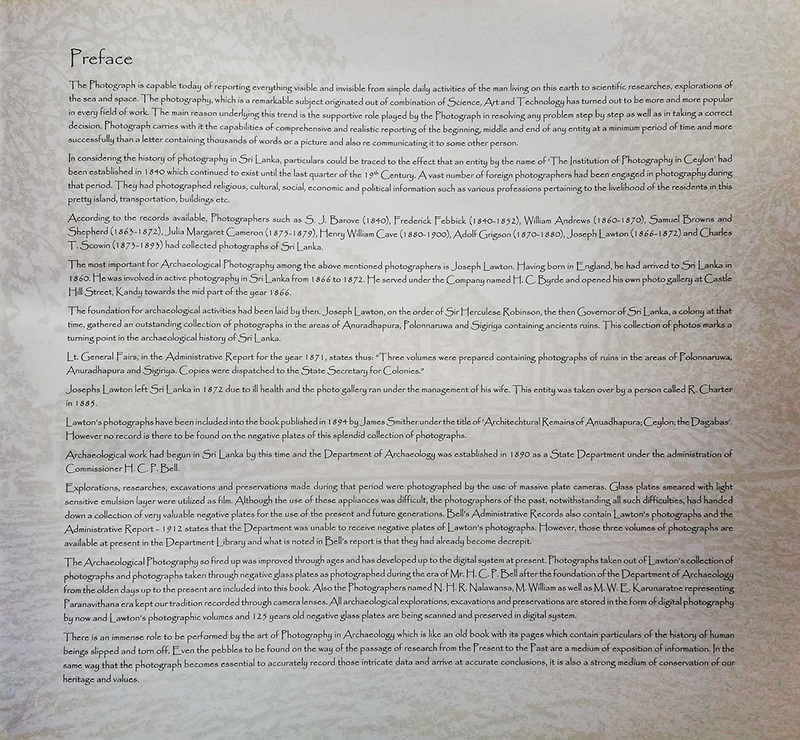 In considering the history of photography in Sri Lanka, particulars could be traced to the effect that an entity by the name of The Institution of Photography in Ceylon' had been established in 1840 which continued to exist until the last quarter of the 19th Century. Avast number of foreign photographers had been engaged in photography during that period. They had photographed religious, cultural, social, economic and political information such as various professions pertaining to the livelihood of the residents in this pretty island, transportation, buildings etcAccording to the records available, Photographers such as S. J. Barove (1840), Frederick Febbick (1840-1852), William Andrews (1860-1870), Samuel Browns and Shepherd (1865-1872), Julia Margaret Cameron (1875-1879), Henry William Cave (1880-1900), Adolf Grigson (1870-1880), Joseph Lawton (1866-1872) and Charles T. Scowin (1873-1893) had collected photographs of Sri Lanka.The most important for Archaeological Photography among above-mentioned photographers is Joseph Lawton. Having born in England, he had arrived in Sri Lanka in 1860. He was involved in active photography in Sri Lanka from 1866 to 1872. He served under the Company named H.C. Byrde and opened his own photo gallery at Castle Hill Street, Kandy towards the mid part of the year 1866.The foundation for archaeological activities had been laid by then. Joseph Lawton, on the order of Sir Herculese Robinson, the then Governor of Sri Lanka, a colony at that time, gathered an outstanding collection of photographs in the areas of Anuradhapura, Polonnaruwa, and Sigiriya containing ancients ruins. This collection of photos marks a turning point in the archaeological history of Sri Lanka.Lt. 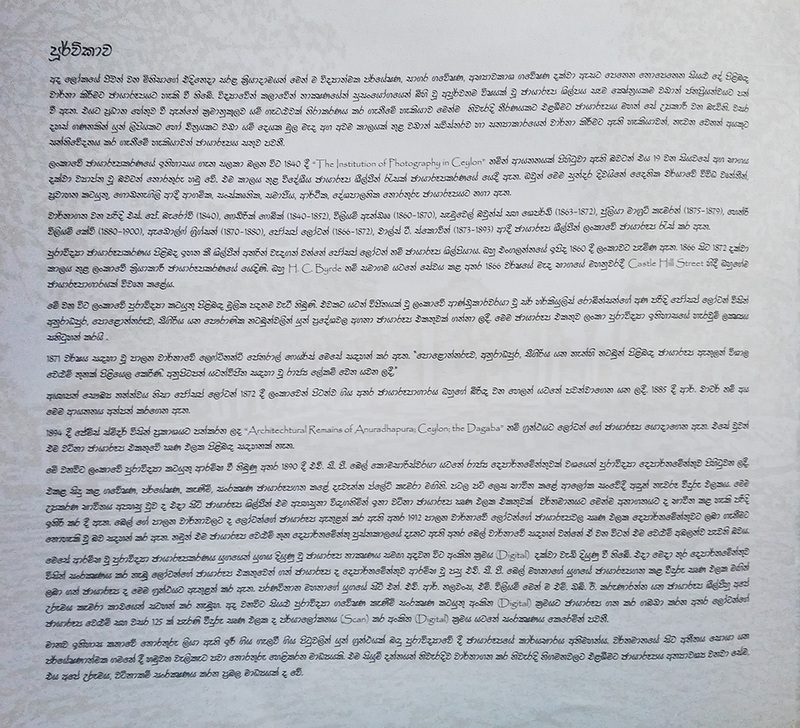 General Fairs, in the Administrative Report for the year 1871, states thus: "Three volumes were prepared containing photographs of ruins in the areas of Polonnaruwa, Anuradhapura, and Sigiriya. Copies were dispatched to the State Secretary for Colonies." Josephs Lawton left Sri Lanka in 1872 due to ill health and the photo gallery ran under the management of his wife. This entity was taken over by a person called R. Charter in 1885.Lawton's photographs have been included in the book published in 1894 by James Smither under the title of Architectural Remains of Anuradhapura; Ceylon, the Dagabas. However, no record is there to be found on the negative plates of this splendid collection of photographs.Archaeological work had begun in Sri Lanka by this time and the Department of Archaeology was established in 1890 as a State Department under the administration of Commissioner H. CP. Bell.Explorations, researches, excavations, and preservations made during that period were photographed by the use of massive plate cameras. Glass plates smeared with light-sensitive emulsion layer were utilized as a film. Although the use of these appliances was difficult, the photographers of the past, notwithstanding all such difficulties, had handed down a collection of very valuable negative plates for the use of the present and future generations. Bell's Administrative Records also contain Lawton's photographs and the Administrative Report - 1912 states that the Department was unable to receive negative plates of Lawton's photographs. However, those three volumes of photographs are available at present in the Department Library and what is noted in Bell's report is that they had already become decrepit.The Archaeological Photography so fired up was improved through ages and has developed up to the digital system at present. Photographs were taken out of Lawton's collection of photographs and photographs taken through negative glass plates as photographed during the era of Mr. H.C.P. Bell after the foundation of the Department of Archaeology from the olden days up to the present are included into this book. Also, the photographers named N. H.R. Nalawansa, M. William as well as M.W E Karunaratne representing Paranavithana era kept our tradition recorded through camera lenses. All archaeological explorations, excavations, and preservations are stored in the form of digital photography by now and Lawton's photographic volumes and 125 years old negative glass plates are being scanned and preserved in a digital system.There is an immense role to be performed by the art of Photography in Archaeology which is like an old book with its pages which contain particulars of the history of human beings slipped and tom off. Even the pebbles to be found on the way of the passage of research from the present to the Past are a medium of exposition of information. In the same way that the photograph becomes essential to accurately record those intricate data and arrive at accurate conclusions, it is also a strong medium of conservation of our heritage and values.